The Tennessee Department of Transportation has finally conceded to the pleas of thousands of motorcyclists and banned big-rig trucks on the notorious Deal's Gap section of US Hwy 129 –– a stretch more commonly known as the Tail of the Dragon. The 11-mile stretch of highway contains more than 300 turns and has become a mecca for motorcyclists from all across the world. But what's fun and challenging for vehicles with two wheels is ill-advised and usually too much for those with 18. Tractor-trailer trucks were frequently getting stuck, turning over, or simply causing huge traffic delays as they crept down the Blount County road. 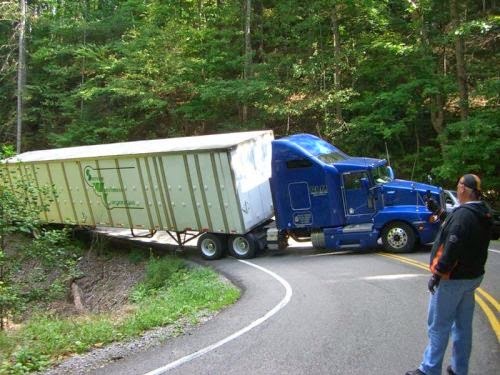 From 2010 to 2012 Tennessee officials counted some 204 crashes on the Deal's Gap section of road and said that many of those incidents involved large trucks. From mid January 2015, signs will be posted indicating a ban on vehicles more than 30 feet long. The Deal's Gap section of road runs through to North Carolina, which has already instituted a similar big rig ban on its side of the state line. Motorcyclists throughout the country have expressed relief at the news, but stress that the road remains a dangerous challenge, especially during more popular times of the year when inexperienced drivers and motorcyclists may push themselves too far beyond their own limits.